Here it is! A sneak peek of a labor-of-love product we’ve been working on over the last year – The Virtues Tree! Back when our first son struggled to help us clean up toys and to smile at strangers (or we struggled with his efforts to do so), I searched far and wide for any concrete and fun tools to help us. After finding a suggestion for a felt board one in The Virtues Guide, my son and I set out to create our own Virtues Tree with paints and poster board. We hung it in our dining room/kitchen area, integrated some activities, and started on a fun path of growing character, one Virtues Fruit at a time! 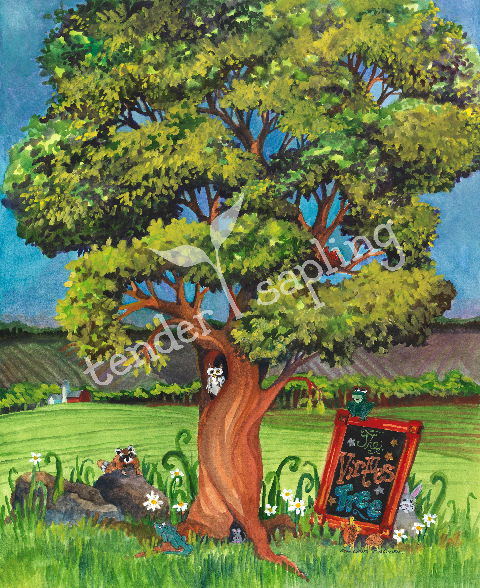 Inspired by our family’s eight-year journey creating and using a homemade painted Virtues Tree, we at Tender Sapling recently commissioned an artist (Scott’s amazing aunt, Marg Bucher) to paint what we think is a gorgeous and whimsical tree that will capture the hearts and imaginations of children! It comes with beautiful full-color and black-and-white versions of 12 Virtues Fruits that a family (or class) can attach to the tree as part of learning about and practicing each virtue. Plus, we’re working on an e-book that will be chock full of creative and concrete ways to help children of all ages explore each virtue! We’re excited to share this low-resolution image with you and to get your input as we prepare to launch it via Kickstarter! If you’re familiar with crowdsourcing sites like Kickstarter, then you know it’s a great way to share your dream with others and join together as a community to make it a reality. But before we get to that stage, we want your thoughts on the Virtues Tree via this survey. You can see previews of the fruits there too. Respond by October 1 and submit your information to enter a chance to win a $25 Tender Sapling Gift Card as a thank you for participating in the survey! Categories: Have Fun, Virtues | Tags: art print, character development, children, Kickstarter, Marg Bucher, new product, product development survey, Tender Sapling, virtues, Virtues Fruits, Virtues Guide, Virtues Project, Virtues Tree, watercolor | Permalink.